ACURAFLEX capsules and cream contain only natural ingredients with proven effectiveness. Acuraflex formulas are based on active and natural ingredients. The effective performance of Acuraflex ingredients has been proven in numerous scientific studies. Extracts of plants, vitamins and minerals that are used in the Acuraflex formula are of the highest quality and are obtained by special extraction methods under strictly controlled conditions. Our specialists test the product quality in several stages is the reason why Acuraflex is more efficient than similar products that are currently available on the market. The combination of active and natural ingredients in Acuraflex products makes a powerful formula that generally improves the health of joints, cartilage, bones and muscles. Acuraflex has an effective analgesic and anti-inflammatory effect and helps chronic patients suffering from rheumatism, arthritis and sciatica as well as osteoarthritis. In a natural way, with no side effects on the body, Acuraflex helps faster recovery from fractures, sprains and surgery. Acuraflex formulations contain extraordinarily high amounts of plants, vitamins and antioxidants as well as high quality and powerful extractions. This is why Nutrilago® Acuraflex is currently the most unique and powerful formula on the market. Arthritis is a chronic disease resulted from inflammation of one or more joints. Although there are more than 100 different types of arthritis, there are three most common forms – osteoarthritis, rheumatoid arthritis and gout. In osteoarthritis treatments, doctors usually combine exercise, lifestyle changes, and the use of nonsteroidal anti-inflammatory drugs (such as Aspirin) associated with numerous negative effects. The study on the potential positive effect of curcumin on arthritis was first published in 1980 in a short, crossover study that involved 18 young patients with rheumatoid arthritis. In this study, the effect of curcumin was compared with the phenylbutazone receptor medicines. Patients were randomly assigned to receive curcumin (1.2 g / day) or phenylbutazone (0.3 g / day) for 2 weeks. Curcumin appeared to be well-tolerated, had no negative effect, and had an anti-rheumatic activity identical to that of phenylbutazone, and manifested itself by reducing morning stiffness and prolonging the time of movement without any problems as well as reducing the swelling. A second study involved 50 osteoarthritis patients evaluated efficacy at a dose equivalent to 200 mg of curcumin per day. Signs and symptoms of osteoarthritis were evaluated using WOMAC results (pain level indicators). Mobility is evaluated by walking behavior tests, and inflammatory status is estimated by measuring CRP levels. After 3 months of treatment, the global WOMAC score was reduced by 58%. Walking distance increased from 76 m to 332 m, and CRP levels were significantly reduced. For comparison, only a modest improvement in these measurements was recorded in the control group. Overall, these results suggest the efficacy of curcumin in the treatment of osteoarthritis. In the following study, the same group of scientists researched a long-term efficacy and safety of curcumin in a long-term (8-month) study that involved 100 patients with osteoarthritis. Patients were divided into a control group (50 patients) and a curcumin group (50 patients) in which patients received 1 g / day of curcumin for 8 months. The WOMAC result was reduced by more than 50%, while walking performance increased almost three times compared to the control group. Studies using Glucosamine sulfate as a dietary supplement have been shown to reduce the rate of collagen degradation (articular tissue) and osteoarthritis symptoms. Glucosamine is comparable to acetaminophen, which is a reference medicine for osteoarthritis. Studies that included athletes who have used glucosamine as a dietary supplement are limited, but preliminary evidence shows that doses up to 3,000 mg of glucose sulfate can prevent joint degeneration. This effect is more important for athletes dealing with highly intensive sports such as running. Glucose is safe to use, and the most common side effect is overweight. Using Glucosamine alone cannot cure osteoarthritis, but it can slow down the progression of the disease. Dr. Pelletier’s team from the University of Montreal studied 194 people with knee osteoarthritis and inflammation of the synovial membrane in the knee. The research lasted for 2 years and participants were divided into two groups. The first group received 1200 mg (pharmacological dose) of chondroitin on a daily basis, while the other group received 200 mg of celecoxib daily. After the initial assessment, researchers resumed numerous factors that would indicate the efficacy of chondroitin. Researchers have performed MRIs to detect cartilage loss, bone marrow changes, and thickening of the synovial membrane in the knee. In addition, they estimated the degree of swelling of the knee in the patient and the degree of pain. After the first and the second year, the researchers found that the knee loss was reduced in the chondroitin group compared to the group that was taking celecoxib. “These findings are important because they show that chondroitin, unlike celecoxib, can, at least partially, reduce the loss of cartilage”, says Dr. Pelletier. Both groups noted a significant decrease in knee swelling as well as showing similar efficacy in reducing osteoarthritis symptoms. Ultimately, participants of both groups were able to reduce the amount of acetaminophen they had taken each day and had better tolerance to treatment. “This study shows that chondroitin sulfate and celecoxib are equally effective in reducing the symptoms of osteoarthritis of the knee. However, it has been found that only chondroitin sulfate is capable of slowing the progression of the disease by reducing the loss of cartilage”. Dr. Pelletier also noted that it might be interesting to do further research to determine the effect of chondroitin in other joints. Osteoporosis is most commonly associated with inadequate calcium intake, but lack of vitamin D contributes to osteoporosis by reducing calcium absorption. Although tumors and osteomalacia are extreme examples of vitamin D deficiency, osteoporosis is an example of long-term calcium and vitamin D deficiency. Adequate levels of vitamin D storage maintain bone strength and can prevent osteoporosis in older adults, individuals experiencing exercise difficulties, postmenopausal women and individuals in chronic steroid therapy. Most vitamin D effects on bone health include calcium, so it is difficult to isolate the effects of each nutrient but its effectiveness is unquestionable. 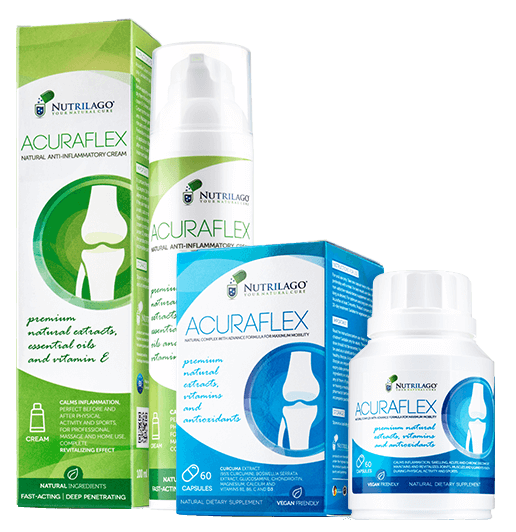 Acuraflex capsules and cream are completely natural products that combine all the ingredients known for their beneficial effect on the health of the joints, cartilage, bone, muscles, and are an effective analgesic. Their anti-inflammatory activity helps chronic patients suffering from rheumatism, arthritis, osteoarthritis, sciatica and faster and easier recovery from fractures, sprains and operations. The sooner the problem is recognized the greater is the effectiveness of harmless and non-aggressive treatments, ie the self-treatment. It is also preferred to take Acuraflex as a supplement to pharmaceuticals for its beneficial effect on the body as it contains numerous vitamins, minerals and antioxidants.